Have you ever tried Spanish rice without any rice? 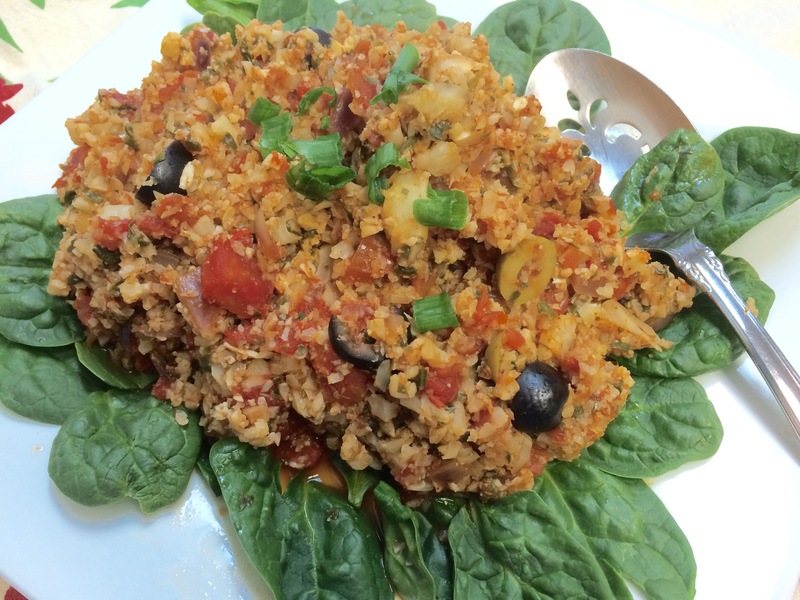 Try this method using riced cauliflower instead! Ever since I first tried using riced cauliflower in fried rice , I’ve been experimenting with it in other rice dishes. It’s surprising how well it substitutes for regular rice, in texture and even taste. By the time you blend it with a sauce, the taste is very similar. Sometimes I will do half and half, like I did my the fried rice recipe. This time I used only cauliflower. That makes this dish very healthy and so much lower in calories. Using olive oil, cumin, and spinach adds exceptional nutrients that are good for heart and brain health. With the Ninja Master Prep blender/chopper I use it took only minutes to have all the ingredients ready to go. If using one, it only takes about 10 seconds for the cauliflower to be small enough. I almost went too small for the recipe here. If are doing by hand, you can use a grater for the cauliflower. In the blender I chopped the onion first, then the spinach, then the cauliflower, each separately. While they were cooking I also ran the tomatoes through, again just for a few seconds so there were very few chunks left. It came out so tasty! You might want to add some tabasco or hot sauce if you like it hotter. I’d suggest you serve it with Spinach & Bean Soft Tacos, a tasty Shrimp Burrito, an enchilada, or any favorite Mexican dish. Colorful and very tasty, and much better for you besides! 1½ cup tomatoes, either canned or fresh. Prep your vegetables so they are all chopped and ready. Combine the tomato, chili powder, cumin and salsa, to mix the spices in. Heat oil in a skillet, then add onion. Saute for 3 to 4 minutes. Add cauliflower for 3 minutes, stirring often. Stir in the tomato spice mixture and the spinach, cover, and simmer for 5 minutes. Most of the liquid should be absorbed now. If too dry you can add more salsa. If too moist, use a slotted spoon to remove from pan. Here’s my favorite appliance, the Ninja Master Prep Professional. You can read my review there, and see a bunch of photos showing how effective it is. Seriously, seconds to chop the veggies! I ve never tried this with cauliflower before, but I definitely want to try it. I like to make vegetarian enchiladas, and this looks like it would be wonderful as a filling. You can find cans of tomato sauce in the same aisle of the grocery store where you find diced tomatoes.